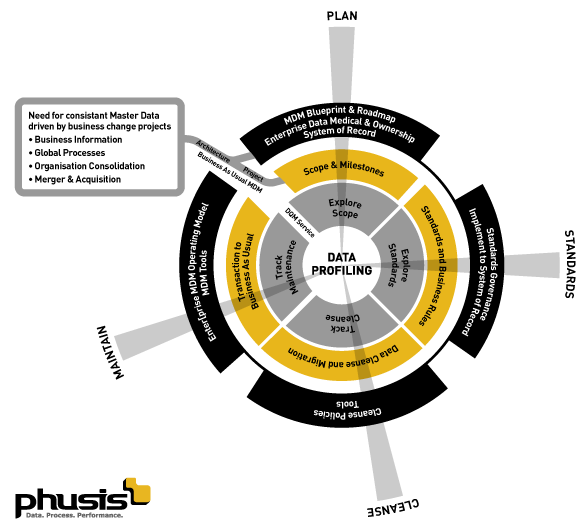 Master Data Management (MDM) is a business capability. It is effective management of the data you care about, the data you use to fundamentally manage your business. For example, accurate data about products, customers, vendors and accounting. Data to make sure you invoice the right customer, at the right address, with the right product details. Data to make sure your management reports are believable and useful. Many organisations leave MDM to a combination of IT and a huge number of business users who can create, change and delete master data. This leads to many differing versions of the same data, data of poor quality, time-consuming arguments about the accuracy of management reports and embarrassing, costly mistakes when dealing with customers and suppliers. Periodic cycles of data cleaning never seem to solve the problem. Excellent organisations have implemented MDM as a controlled, efficient business service, often using a shared services model. Requests for changes to data are properly controlled, authorised and audited. Changes are only executed by trained operators who enter the data on all systems consistently at the same time. Ownership of the data is explicitly allocated to senior business roles. High data quality and accurate reporting is achieved and sustained. Benefits range from reduced costs of MDM execution and reduced costs in managing the adverse business effects of poor data quality to a simple reduction in the cost of software licences. Phusis helps our clients make the complete journey from where they are today to excellence in MDM. From initial planning, scoping and the development of a compelling business case to establishing the processes, roles, shared services and technical capabilities to achieve efficient MDM and high quality data on a sustained, business-as-usual basis.